To help prolong the growing time, now is a good time to purchase or make a cold frame .Coldframes and mini-greenhouses are useful on the allotment and can also be an alternative to a greenhouse. 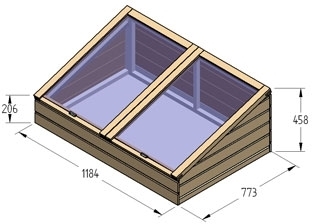 Frames are boxes that lie flat on the ground with a glazed, sloping lids and mini-greenhouses are glazed boxes that stand vertically with openings on one side. glasshouses and polythene tunnels still provide the best growing environment as they are walk-in and the conditions inside are easier to manage. The reason for this is because the larger volume of air acts as a buffer, reducing fluctuations in temperature and humidity – so are less severe than inside coldframes and mini-greenhouses. In spring and early summer, coldframes and mini-greenhouses are a useful place to harden off tender young plants, such as half-hardy annuals and vegetables. They can be used to provide a halfway house before plants experience the harsher elements on the allotment. In late spring and summer, use coldframes and mini-greenhouses to provide extra warmth for tender summer crops, such as aubergine, tomatoes and chillies. This encourages quicker ripening and a larger crop. They are also really useful for propagating plants. Try semi-ripe cuttings, raising seedlings, and growing-on young plants. In autumn they are useful in protecting cuttings and young plants from cooler, unsettled weather and the first frosts (but only mild frosts). In winter, coldframes and mini-greenhouses can be used to shield alpines from rain and so prevent them from rotting. They can also be used to overwinter young annuals and other plants. You can add a layer of bubble wrap on the inside to provide some insulation against frost and provide additional draught proofing. However, the bubble plastic will reduce light and ventilation. Plants and seedlings grown in larger areas or rows can be protected with panes of glass raised on bricks and old window frames resting on sides made of wood. You can often find these in skips. All these are inexpensive and, if care is taken with ventilation, often prove good enough for most purposes. One of the problems with mini-greenhouses is that they tend to blow over in the wind – this can be very disheartening! The best way to combat this problem is to put breeze blocks inside to weight it down as turning up to your allotment to find everything blown away is not fun! Wrap any special plants with horticultural fleece, but make sure it is tied well as the wind will soon take it away – you could try to use hessian sacking as this is less vulnerable to the wind.